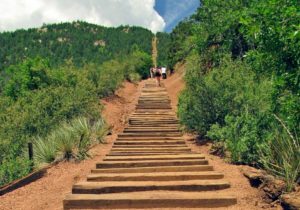 The Manitou Springs Incline, also known as the Manitou Incline or simply the Incline, is a popular hiking trail rising above Manitou Springs, Colorado, near Colorado Springs. The trail is the remains of a former 3 ft (914 mm) narrow gauge funicular railway whose tracks washed out during a rock slide in 1990. 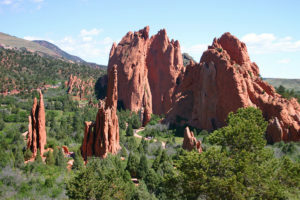 The Incline is famous for its sweeping views and steep grade, with an average grade of 45% (24°) and as steep as 68% (34°) in places, making it a fitness challenge for locals in the Colorado Springs area. The incline gains almost 2,000 feet (610 m) of elevation in less than one mile. Here is a fly-over video provided by the Manitou Incline App for the iPhone. 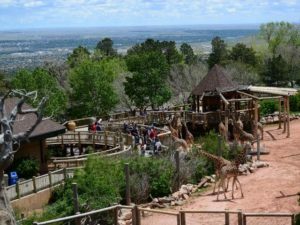 The Cheyenne Mountain Zoo is a zoological park located southwest of downtown Colorado Springs, Colorado, on Cheyenne Mountain in the United States. At an elevation of 6,800 feet above sea level it is the highest zoo in America.